Professor Stroud's research is in the area of experimental and theoretical quantum optics and atomic physics. Current projects include the study of the boundary between classical and quantum mechanics as manifested by Rydberg electron wave packets, the use of electromagnetic field pulses to obtain detailed control of the location and motion of an electron within an atom, the use of semiclassical methods in atomic physics, and quantum computing. He is also looking at generation of quantum states of light using nonlinear optics. 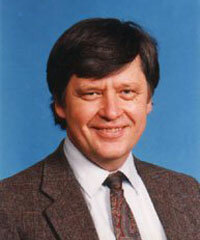 His research interests have ranged over most of theoretical and experimental quantum optics. Among the research accomplishments of his group are the first observation of the modification of the spectrum of spontaneous emission by a resonant laser beam, and early observations of various phenomena in three-level atomic systems driven simultaneously by two resonant laser fields including the Autler-Townes effect and coherent population trapping. More recently his group made the first observation of a spatially localized electron wave packet within an atom and carried out electron interferometry within an atom. A more detailed description of recent work including preprints and reprints can be found at the Wave Packet Homepage. An extensive tutorial on Rydberg wave packets can also be found there.